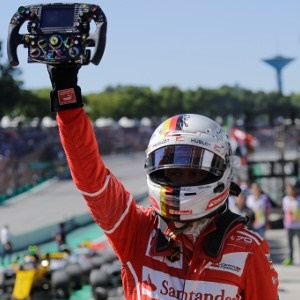 Sao Paulo - Sebastian Vettel bounced back from his world championship disappointment in fine style on Sunday when he won a sunlit Brazilian Grand Prix for Ferrari. It was Vettel's first win in eight outings since the Hungarian Grand Prix in July and his fifth of the season. It was also Ferrari's first win in Brazil since 2008. "It's been a tough couple of weeks for us, but it's nice to get both cars on the podium here," said Vettel. "I had a good getaway and then I had wheelspin, so I thought I missed my chance but I think Valtteri had the same so I surprised him. "I wanted to pull out a gap and then to control the race from there and it worked out." Bottas admitted: "My goal was to win so it was very disappointing. We lost it in the start. After that it was very close. I tried to put some pressure on Sebastian, but it didn't happen. Lewis did a great comeback to score points." Raikkonen admitted: "Lewis got close to me at the end, but it's impossible to overtake here if you have close speed between the cars." "I feel so emotional today," admitted Massa. "All you guys, thank you very much for everything that we passed together and for all the support and energy." This incident saw Ricciardo spin on a kerb, hit luckless Belgian Stoffel Vandoorne's McLaren and, in turn, Dane Kevin Kevin Magnussen's Haas. The latter two were forced to retire as, in a separate incident, Frenchman Romain Grosjean lost control of his Haas and slid into compatriot Esteban Ocon's Force India, taking the pair of them off into a gravel trap. It was the first retirement of Ocon's career after 27 races and Grosjean was handed a 10-seconds penalty. "It was fun," said Hamilton. "Just like my karting days when I started from the back. But I messed up yesterday and I know I was quick enough to win from pole to flag, but I made the job a lot harder. "When I woke up this morning my goal was to do the team proud and score points. I tried, but ran out of tyres at the end."